Hakusan, Japan, September 6, 2018 – EIZO Corporation (TSE: 6737) today announced the new ColorEdge CG279X – a 27-inch monitor with 2560 x 1440 resolution – and ColorNavigator 7 – the latest in color management software for its line of ColorEdge monitors. The ColorEdge CG279X is the successor to CG277. Distinguishing it from its predecessor, the ColorEdge CG279X comes equipped with HLG (hybrid log-gamma) and the PQ (perceptual quantization) curve for displaying and editing HDR (high dynamic range) video content. The optimized gamma curves render images to appear more true to how the human eye perceives the real world compared to SDR (standard dynamic range). Having a monitor equipped with HDR gamma support ensures professional creators can reliably display HDR content during the editing process so it is ready for color grading at the end of the workflow. The ColorEdge CG279X’s wide color gamut reproduces 98% of the DCI-P3 color space used in the media and entertainment industry. In compliance with the DCI standard, the ColorEdge CG279X offers a high contrast ratio of 1300:1 for producing true blacks that are otherwise difficult to display on a typical LCD monitor. In addition, it is equipped with a retardation film which allows tones to retain their depth even when viewed from an angle. The ColorEdge CG279X is the first in the ColorEdge series to be equipped with USB Type-C connectivity, which can transmit both video and data signals using a single cable. The monitor is also equipped with DVI-D, HDMI, and DisplayPort inputs. The ColorEdge CG279X is equipped with an upgraded built-in calibration sensor which allows the user to continue to operate the monitor even during recalibration. The sensor swings onto the screen at a time designated by the user and takes up minimal space so work remains uninterrupted.1 The built-in sensor eliminates the need for a third-party calibration device and ensures the screen stays color-accurate. Furthermore, with EIZO’s new ColorNavigator 7 color management software, users can regularly calibrate and quality control their monitor or multiple monitors quickly and reliably. ColorNavigator 7 combines all the features of EIZO’s previous color management software, ColorNavigator 6 and ColorNavigator NX, to create a new and improved solution for creatives in a range of fields. With ColorNavigator 7, users can calibrate all color modes simultaneously, setup regular recalibration intervals, and maintain quality control in multi-monitor environments all with a single software application. The color and brightness of an LCD monitor can shift due to changes in ambient temperature and the temperature of the monitor itself. The ColorEdge CG279X is equipped with a temperature sensor for accurately measuring the temperature inside the monitor, as well as estimating the temperature of the surrounding environment. With this temperature sensing and estimation technology, the monitor adjusts in real-time so gradations, color, brightness, and other characteristics continue to be displayed accurately. Furthermore, EIZO uses AI (artificial intelligence) in the estimation algorithm of the ColorEdge CG279X so it can distinguish between various temperature changing patterns to calculate even more accurate correction. EIZO’s patented digital uniformity equalizer (DUE) technology also counterbalances the influences that a fluctuating temperature may have on color temperature and brightness for stable image display across the screen. The monitor features the sleek new cabinet design of the latest ColorEdge models. The monitor’s bottom bezel is approximately 46% thinner than its predecessor’s and the monitor depth was reduced by approximately 20%. A carrying handle is built-in for easily moving the monitor between locations and the stand features a quick release button which allows easy detachment from the monitor with a single touch. Electrostatic switches that light up are used in place of traditional buttons for seamless access to the monitor’s OSD menu. EIZO will be showing the ColorEdge CG279X and ColorNavigator 7 for the first time at IBC 2018 in Amsterdam, the Netherlands from September 14 – 18. Visit Hall 7 Booth D12 to see the products. 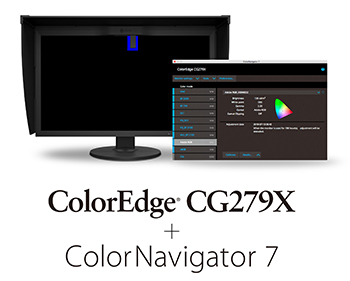 The ColorEdge CG279X will begin shipping and ColorNavigator 7 will be available for download in November, 2018. Date of availability varies by country so contact the EIZO group company or distributor in your country for details. 1 It is not recommended to carry out color critical work during recalibration as the screen’s colors will adjust during this process. 3 Usage time is limited to 30,000 hours.